We previously learned how to write a publisher node to move Husky randomly. BUT: what good is publishing all these messages if no one is there to read it? In this tutorial we’ll write a subscriber that reads Husky’s position from the odom topic, and graph its movements. Instead of just copy-pasting code into a text file, we’ll pull the required packages from GitHub, a very common practice among developers. That’s it! You should see an src and launch folder, as well as a CMakelist.txt and package.xml in your ros101 folder. 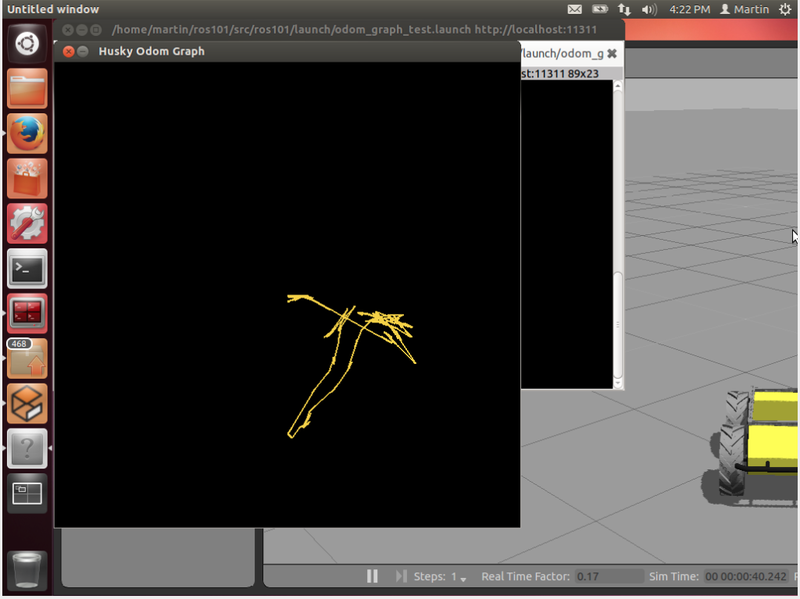 You now have the package “ros101″, which includes the nodes “random_driver.cpp” and “odom_graph.py”. Much like the C++ publisher code, this includes the rospy library and imports the Odometry message type from nav_msgs.msg. To learn more about a specific message type, you can visit http://docs.ros.org to see it’s definition, for example, we are using http://docs.ros.org/api/nav_msgs/html/msg/Odometry.html . The next block of code imports the pygame libraries and sets up the initial conditions for our display. This is the odometry call back function, which is called every time our subscriber receives a message. The content of this function simply draws a line on our display between the last coordinates read from the odometry position message. This function will continually be called in our main loop. Now it’s time to test it out! Go ahead and close the odom_graph.py file and build your workspace using the catkin_make function in your workspace directory. In this tutorial we have provided a launch file that will start the random_driver and odom_graph node. The launch file is located in ~/ros101/src/launch and is called odom_graph_test.launch. If you want to learn more about launch files, check out our launch file article on our support knowledge base. We will now source our workspace and launch both nodes with the launch file in a new terminal window. There you have it! Our subscriber is now listening to messages on the odom topic, and graphing out Husky’s path. See all the ROS101 tutorials here.